Back in February, I wrote a blog post about the fact that I had been blogging for 2 years and that to mark that point, and as a thank you for taking the time and trouble to read the blog, I was going to give away one of my mugs. So, that’s what I’m doing. 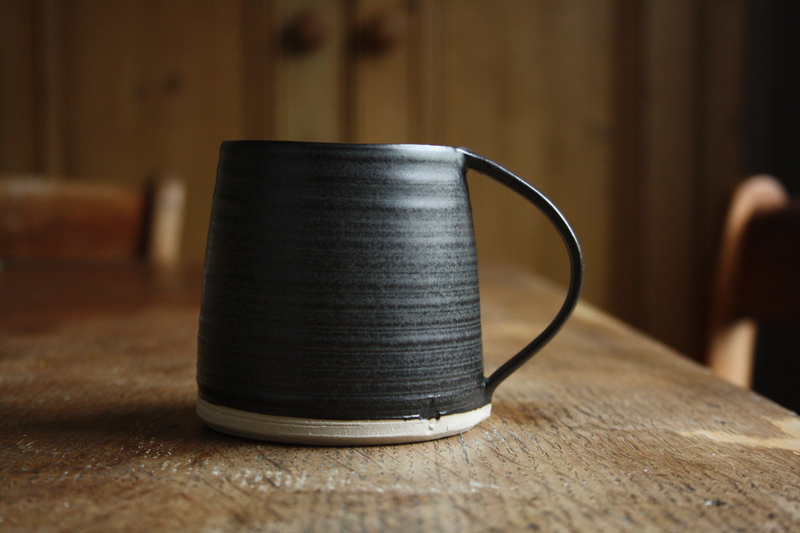 If you would like to be in the giveaway for this black coffee mug, please leave me a comment saying what you are currently making or what you would be making if you had the opportunity. I’d be fascinated to know what everyone’s up to. The giveaway will close on Sunday 9th June. And thank you again for reading this blog. The support it provides is essential to my life as a potter. Well, the train keeps rolling and I can’t apply the brakes yet… Pulse 2013 and Palace Art Fair are over, Saltaire Arts Trail is this coming weekend and The Contemporary Craft Festival in just over two weeks time. The pace is currently a little relentless but I need to maximise the opportunities that these weeks bring. Pulse was not quite what I expected. The area I was in, Launchpad, was like a mini British Craft Trade Fair (BCTF) with the rest of the hall taken up, pretty much, by more commercial enterprises. Interestingly, it was very southern focused. Almost all of the buyers came from the midlands downwards, with a lot from the home counties and the south coast. 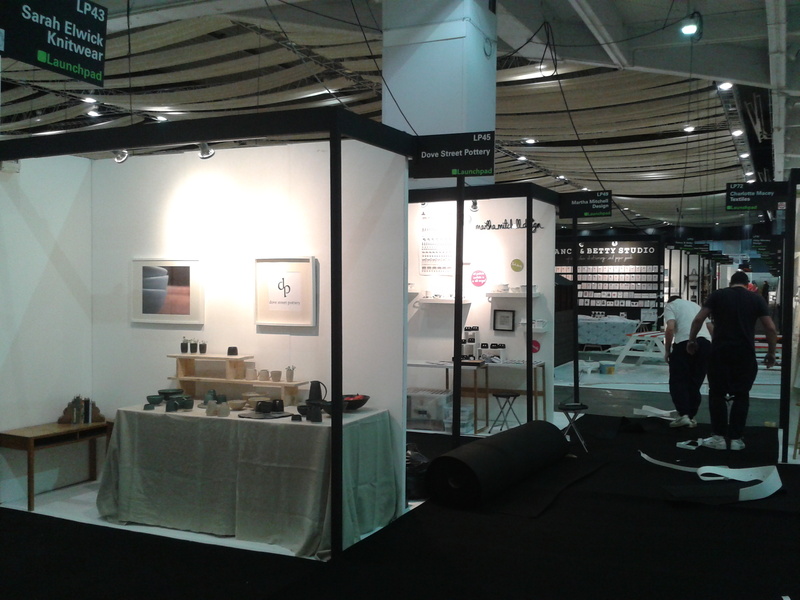 This is in marked contrast to The British Craft Trade Fair where the buyers came from all over the UK, including the south. I think most makers around me found it to be on the slow side, not an uncommon situation at fairs at the moment with little money about, but I made some really good contacts, took some orders and generally found it to be worth doing. I had promising conversations, including with Piyush Suri about an exciting opportunity in his shop in August, as well as stocking the shop; Petersham Nurseries placed an order, which I’m very much looking forward to delivering; and a well-known shop, which I had sent samples to before the event, came and all-but said the word order (if they do, I will definitely be letting you know…). Having said I found it to be worth doing, at this stage I don’t think I will do it again. I want to apply for Craft, which will be part of Top Drawer and Home at Earl’s Court in January, instead, which I think might be a better time of year. So, I want to do Craft in January and BCTF in April. BCTF and Pulse both went far better than I could have imagined when I first applied for them. I have orders to fill and fairs to participate in, and I feel that it will not be possible to deliver on these while I am working part-time as an art technician. Therefore, I have decided to make the leap to being a full-time potter! My last day working at the school will be June 13th. It is a daunting prospect and I have mixed emotions about it but the over-riding one, by a country mile, is one of extreme excitement and anticipation. It’s May already, I can’t believe it! Where does the year go? These next 5 weeks are going to be extremely busy, as I’ve got 4 events in 5 weekends. Starting with Pulse 2013 this weekend, then Palace Art Fair, Saltaire Arts Trail and, finally, The Contemporary Craft Festival on the 7th – 9th of June. We’ll have to see how my lower back holds up – it doesn’t like standing in one place for too long and I don’t really like sitting, as it is much harder to engage with visitors. 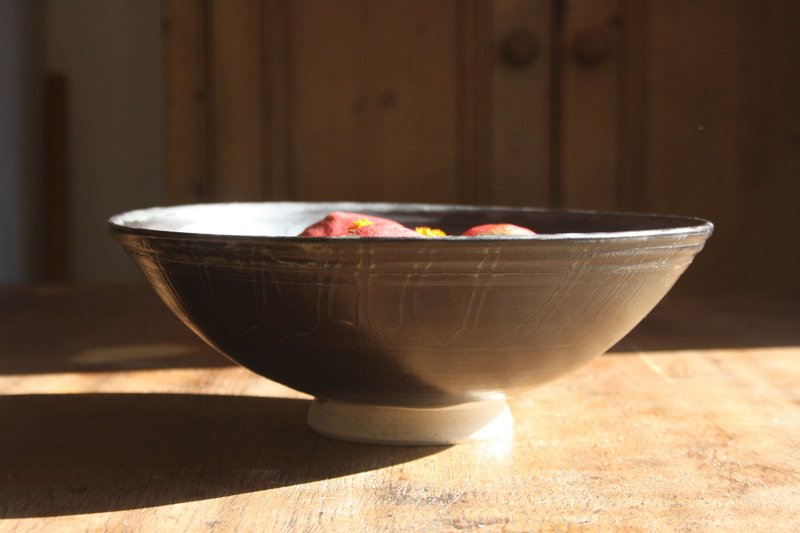 The fruit bowl that I threw a couple of weeks ago came out of the kiln this week. This one is about 27 and a half centimetres in diameter. I’m really pleased with it, although, there is a lot to learn in terms of glazing something bigger than I am used to. The inside is an unexpected delight. 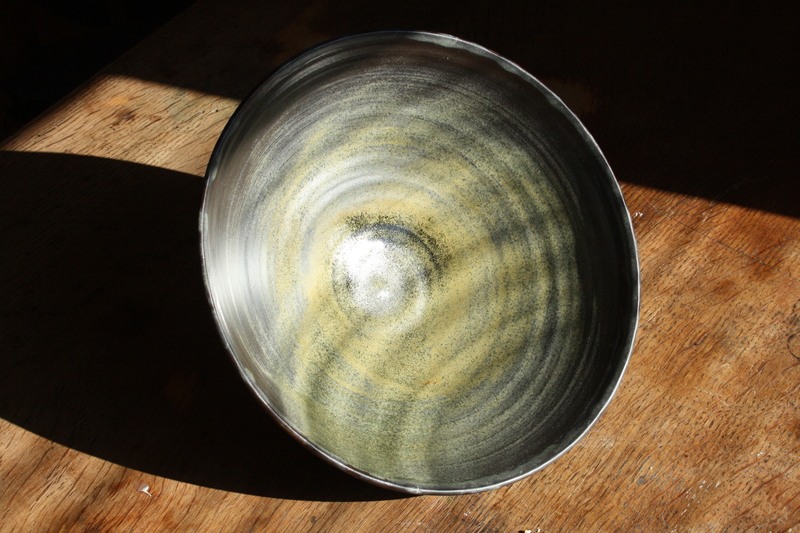 Where the glaze has been applied more thickly, as a result of lying in the hollow of the bowl for longer when I swilled the glaze around to cover the inside of the bowl, it shows this wonderful golden browny, greeny, ochre. 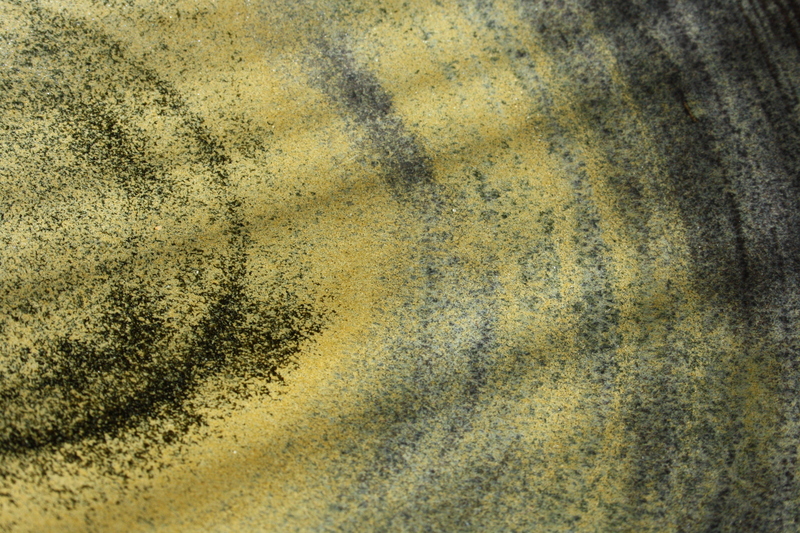 This browny green flows across the concave surface showing the path that the glaze took during the glazing process. It is very dynamic and fluid. I love the way the decoration comes directly out of the process of its making. Having glazed the inside, I then turned the bowl over and set it on a banding/modelling wheel and poured the glaze over the outside as I spun the wheel. As a result, these splendid shapes were created on the edge of the bowl, which, when the bowl is turned the right way up, make for an interesting pattern. A couple of things, though, to remember for next time. 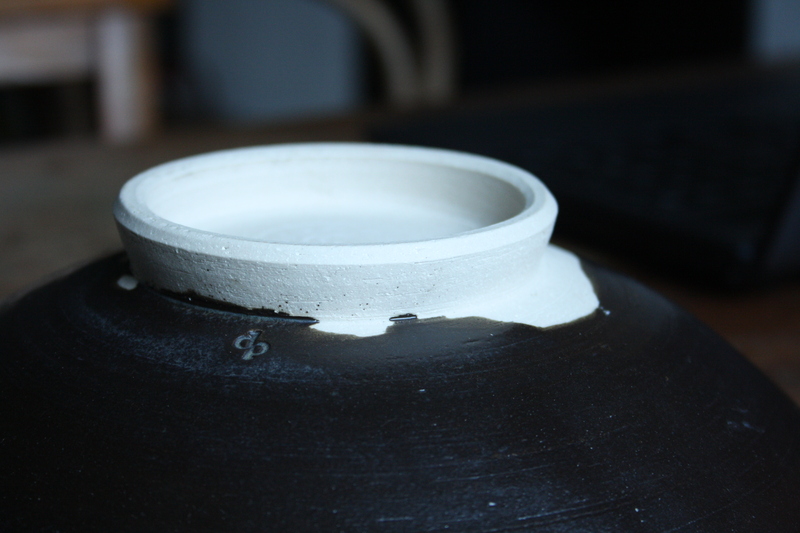 The first is that the biscuit-fired bowl doesn’t absorb the glaze very quickly when it is being poured over the surface (compared to when a pot is submerged in a bucket of glaze). The glaze has, therefore, come out thinly on the outside, so next time I will have to apply two or three coats and layer them up. 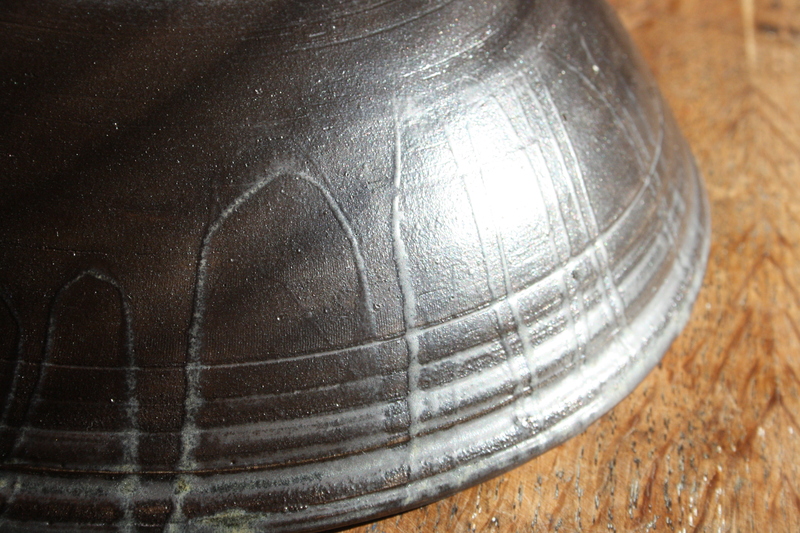 The other thing is that it is difficult to apply the glaze neatly around the foot-ring when pouring the glaze. I haven’t used wax around the foot of a pot before to protect it from getting covered in glaze but, for these larger bowls, I shall paint wax over the foot-ring and the first curve of the bowl, which will resist the glaze and provide a nice, neat finish. I’m going to take this bowl to Pulse and we’ll see if anyone likes it enough to place an order. You are currently viewing the archives for May, 2013 at The Hopeful Potter.